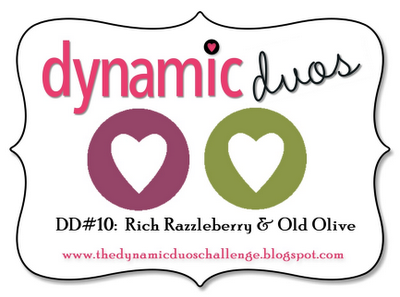 Hard to believe we are already on Challenge #10 at Dynamic Duos! The color duo this week is Rich Razzleberry & Old Olive. The closest colors I had were Vineyard Berry & Olive by Close To My Heart. I really enjoy making Christmas cards and Christmas in July seems to be the going trend at the moment. 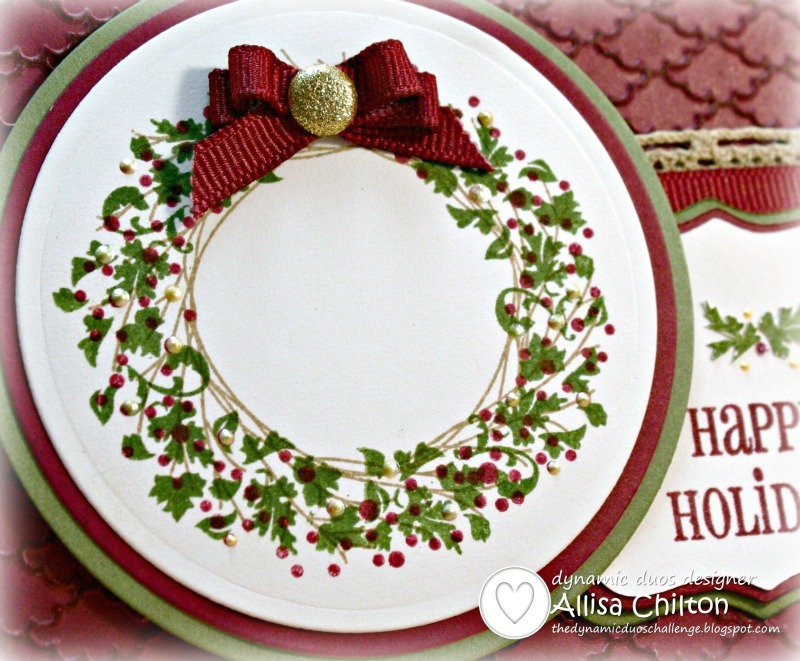 The Remarkable Wreath stamp set is not a traditional Christmas stamp set, and can be used for a variety of cards year round. I chose to stamp my leaves in olive to mimic holly and my berries in vineyard berry. Design Tips-My circles were cut with Circle Stax dies by MFT. My decorative shapes were cut with the Cricut Art Philosophy cartridge. For my embossed panel, I ran Vineyard Berry through my Cuttlebug with the Fancy Fan embossing folder. I then brayered Vineyard Ink over the embossed image to darken the pattern. I layered grosgrain ribbon over the lace trim. Thanks so much for stopping by. Be sure and link up your creation by noon on Thursday (PDT)! GORGEOUS Christmas card Allisa! Love the embossed background and that wispy wreath is divine!! Love, love, love how you did your wreath! Beautiful Christmas in July card. Gorgeous card - I love that colour combination and your design is beautiful. Great Christmas in July card! Thanks for joining us at Art Impressions this week! 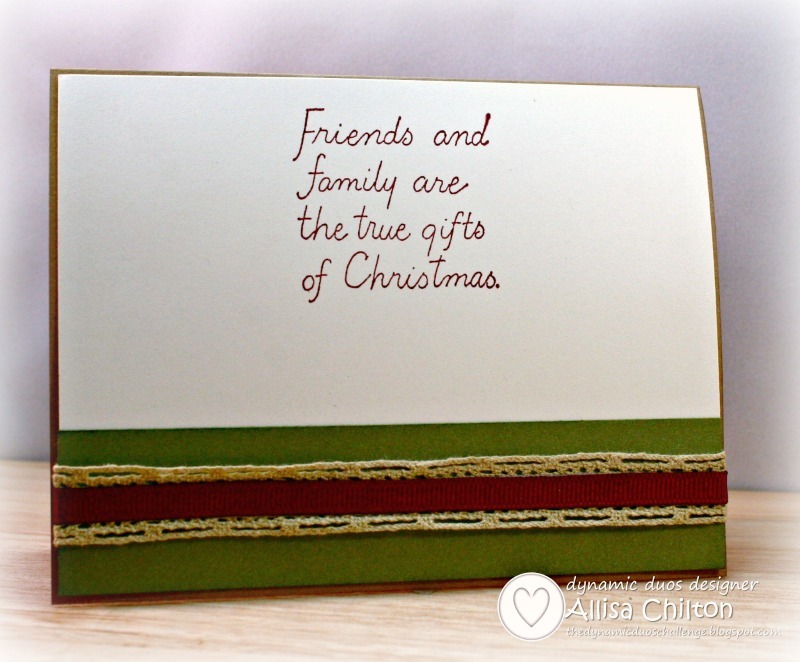 A classy and upscale card - and I love the embossing with the fussy cutting at the bottom. Very rich and detailed !! We were so happy you joined us last week at Papercraft Star, celebrating our 2nd anniversary !! Very beautiful. Thanks so much for joining us over at the CCEE Stampers blog. Beautiful card Card, I like the design and the lovely sentiment, Thanks for joining in with us at TTCRD, good luck. Hi I am back again to see your beautiful card and Thanks for joining in with us at Hooked on Craft this month, good luck. I love how you brayered over the embossed background to give it more depth! Very pretty card! What a pretty holiday card, the colours are fantastic.